Dr. Jay Bansal of LaserVue Eye Center is now helping to give the Bay Area a different view through the option of Implantable Contact Lenses. Rather than applying contacts to the outer eye, ICL’s involve a small, special lens being surgically inserted inside the eye. Dr. Bansal makes a small incision in the cornea and inserts the foldable, Visian ICL ®, between the iris and the natural crystalline lens. The new lens avoids contact with other structures of the eye and is invisible to others by how it is positioned. Unlike traditional contacts, the ICL requires no maintenance. This FDA approved procedure takes only 15 to 30 minutes and patients are able to see clearly within a few hours of the procedure. About Laservue Eye Center and Dr. Bansal: With four locations serving the Bay Area, LaserVue Eye Center sets the standard for excellence in eye surgery and vision restoration on a very patient entered, individual level. 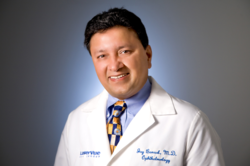 Dr. Jay Bansal and his staff are highly experienced in All-Laser LASIK procedures as well as cataract surgery using state-of-the-art lifestyle lens implants. With over 20,000 surgeries performed, Dr. Bansal is a nationally recognized refractive surgery, LASIK, and cataract surgery expert.